If you lost your phone, tablet or your hard disk on your home computer dies, what would you do? Sure, you can replace the actual hardware, albeit at some expense and annoyance, but you’d eventually be back up and running in the end, right? What about your software and data? What about your e-mails, contacts lists, documents, photos, applications, passwords and other account settings, license keys for all the applications you’ve purchased over the years? You do have backups, right? Stop and think for a few moments about just how much your daily life revolves around these pieces of information and what would happen if they were simply not there anymore! Backups are the one chore we all love to hate, yet so much of our lives depend on having them without us realising it. It’s kind of like an insurance policy. You pay your premiums regularly and hope never to need to claim on the policy. It’s exactly the same with backups, which are the last line of defence in our digital world. 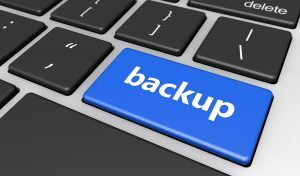 There are lots of different types of backups you could be considering. At the most basic level, you can make copies of your most important files. However, that’s not going to help you if all those copies are on the same drive. If you lose the drive – you lose everything. You can keep copies on different drives but what happens if the computer is stolen or there’s a fire that damages everything in your office? You’re back to square one again. Keeping data in the cloud is an option but even that’s not the end of the story. What if you are suddenly unable to access them due to an internet outage or you’re suddenly locked out for some other reason? Another problem to consider is version history. You are already a step ahead of the game if you have multiple copies of the same data synchronised to multiple locations. But, if you accidentally overwrite that important file or save the wrong information, those errors are also synchronised to your backup locations. Clearly, some sort of version history mechanism would be useful, so you can go back to earlier versions of your most important files. How are you storing your passwords? Are you writing them down where they can be found and copied? Keeping good backups yet maintaining an acceptable level of security can be a fine balance – especially if you’ve given little thought to it. I was recently locked out of one of my online accounts. Unfortunately, my e-mail is linked to this account and the impact was immediate and debilitating. Suddenly, I had to remember the answers to those security questions that I set up several years ago when I was living in another country. Did I use capital letters? Was it properly punctuated? Was that an abbreviated word I chose? Who did I say was my favourite teacher again? With so many possible permutations, I quickly found myself locked out with too many failed attempts. If only I’d paid more attention to those questions and answers when I set it up originally. Setting up backups is only part of the solution. The only thing worse than finding that you actually need your backups is finding that your backups weren’t working like you thought they were. When setting up backups, it’s critically important to verify them with a restoration test. Otherwise, you should not automatically assume they are reliable. If you are going to trust your digital self to your backups, you really do want the peace of mind in knowing that they will be there for you if (or when) you need them. Keep multiple copies of your data. Keep a duplicate copy locally for quick retrieval – ideally on a different drive. Keep a duplicate copy somewhere in the cloud. Use some sort of version management software (such as Apple’s Time Machine) so you can go back to earlier versions of your files. Use a RAID solution, where data is replicated across multiple disk drives such that any one disk can fail but you don’t lose any data. Keep a copy of your data stored off-site somewhere. This could be on a spare drive stored at a friend or relative’s house – the farther away they live from you, the better (think of natural disasters that might affect both of you). Talk to your service provider and see what backup options they can provide you with. Consider how you will access your passwords and other security information just in case the worse does happen. There are lots of solutions to the backup problem and chances are that many of them are already within your reach. Take the time to consider and implement whichever ones you can. Do it today, as tomorrow may be too late!